With the large volume of photos taken these days with digital cameras, most of them may never make it to print. 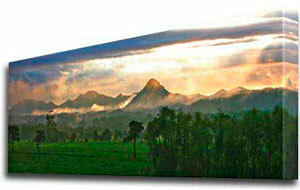 Why not turn your photos and art into long life, quality canvas prints, hung on the wall for all to admire? Family portraits, loved ones, pets, weddings, holidays, landscapes, art creations - all can be printed onto canvas. 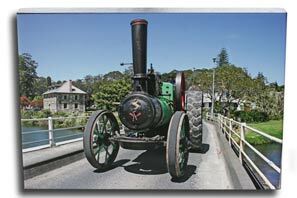 This is a great way to transform your images into unique effective prints that will become a focal point at your home or office. 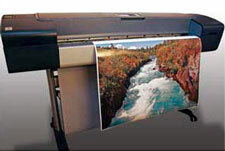 All canvas prints are created using a Hewlett Packard Z3200 large format pigment ink printer. This ensures a very long display life, resistant to light and atmosphere under standard display conditions. We use Breathing Color's high quality Lyve Matte Canvas 450gms canvas, made in the United States (Click Photo for link). Coated with Breathing Color Glamour II sealant this high quality heavy duty canvas provides a complete resistance to cracking when stretched. If your printer can't name a quality brand, how good is it? It is acid and lignum free with no artificial brighteners. The coating gives a scratch resistant protective finish, and increases resistance to image fading. Be aware of other printers offering inferior canvas prints with weights like 250gms - this is lighter than our photo paper! Lyve canvas has an archival quality certificate from the UK Fine Art Trade Guild (Click image for 150KB PDF in new window). This means it has passed their Blue Wool Test for light fastness and durability of 100 years minimum display life under standard conditions. Don't ask for anything less! 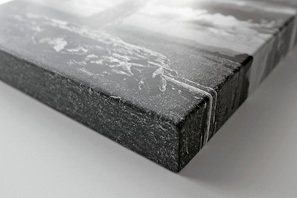 Mounting - Your canvas print is mounted onto 40mm deep x 26mm thick Cedar timber frame. 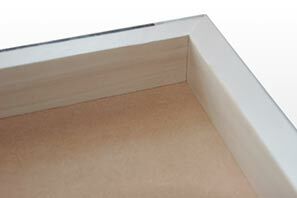 Underneath, the canvas and frame is supported and strengthened by a 3mm MDF backing producing a total depth of 43mm. All frames are custom hand made at the time your canvas print is ordered, so sizes can be tailor made. 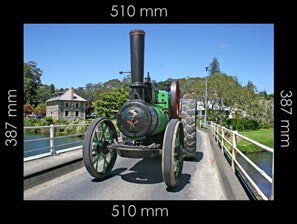 Please ensure you take into account 45mm of image on each side will be used in the wrap around process. An extra width of plain white canvas is added to give a full wrap on the rear of the frame giving a nice tidy finish. See Pricing Page for further details. If your photo is limited in print area, for a small extra charge, the sides can be extended so you don't lose any part of your original photo. 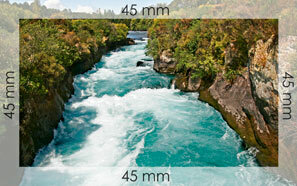 In this example, to make an A3 (297mm x 420mm) sized canvas framed print with a black border, a file image with print area measuring 387mm x 510mm (45mm each side) would be required to wrap the image to the rear edge. Please ensure you take this into account as it can be easy to lose a special part of your photo. We will endeavour to point this out at time of consultation.